It's thirty years since you came to Australia? That's correct. Thirty years on the 1st of May, 1968. It's an easy date to remember. You worked in film in Poland and Israel? I started the profession in Poland. I changed from music to film. I really wanted to be a big composer - if not a big composer, at least a big pianist, but it didn't work. After three years studying musicology and music, I decided I wouldn't be able to give anything to people as a musician. Then Jersy Terplitz opened the film school in Krakow, and I jumped to the film business and I found it is very interesting. For about twenty years I was working in live action, not in animation. In live action and in making features, I started as assistant director and then worked as a cameraman. I was working a little bit in the laboratory and then a little bit on editing, and finally my son was born and I decided rather to make animation, to stay at home and not to go away for shooting, shooting for three months away was very, very hard. We started in Paddington in Australia, when I arrived with my wife, and I found this even more interesting, having a public of children, not of adults. I prefer children as audience than adults. I was making features for children and the features had been going into the cinema. Then I was looking at my little audience - if a lot of them, during this film, had been going to the toilet, I understood that the film is not so good. If they stayed all the time in the cinema, this meant I was very happy. The first feature we have done in Australia was Dot and the Kangaroo. Maybe the film wasn't so good, but it was a big success and children love it. And from this we progressed to another film, The Little Convict with Rolf Harris. It was another success. Slowly, slowly we have been doing over ten full-length features, specialising with such competition from Disney. We wanted to be a little bit different, and we've been doing films on live action background - not drawn background but live action background - coming to the conclusion with the Blue Mountains, our biggest location, that they were so beautiful we had rather better film them as they are, not to draw. After these few live action films, we had seen, unfortunately, that the cinema is not good enough for us because the children are going only during the school holidays, which is a very limited time, and therefore we switched to television. The last full-length feature we have done was Blinky Bill - that was a success and was a big success in Europe - before we decided to make a television series. And today, really, in Germany, where I visit, every child knows who is Blinky Bill. 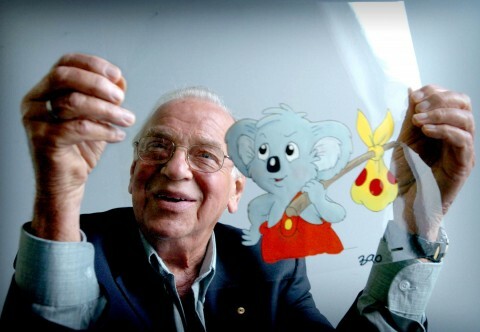 Every child in Germany knows Blinky Bill. Then after Blinky Bill we have done Tabaluga which is today the biggest success in Germany and in France. We finish now Skippy and now we are working on a big production, again 26 episodes for television - it's Flipper. Flipper is maybe not such a typical Australian production, it was an American film with live action, but it is international with plenty of those Flippers jumping. And we enjoy, we are very, very lucky because all these seventy people who are working with us in the studio, they enjoy because all those people they are doing what they wanted to do, to make drawings. Not every profession can say this. I was today visiting my dentist and I don't believe he enjoys his profession, but he has to do it because he has a family and has to make the few dollars to spend. Could I go back to some of the themes that you have treated. I noticed in an article that you had won some prizes for short films at the Sydney Film Festival after you arrived. That's correct. Really the animation I mentioned that was my first was Dot and the Kangaroo, but it's not true. Before this, I was making a lot of experimental films. Experimental films means just for my pleasure, to satisfy my ego rather than my pocket. But I believe it was such a big pleasure when I was getting a prize in the festival, was a bigger pleasure than to earn a million dollars. Unfortunately, now I don't have time to make those experimental films, but this I am dreaming about experimental films. And those experimental films have been animated, a lot of them have been animated. Not a lot of prizes and unfortunately today I can't do this. What were the subjects of those experimental films? I would call them very general and exaggerating way - a lot of people talk philosophy about life - they're experimental films really not for adults. When I was screening, because from time to time I had screenings for audience invited by all kinds of organisations, usually I was studying those experimental films - part of the audience understood what it was all about and part didn't, and those people who didn't understand what it's all about, I asked them to ask those who answered they understood. The subject was light. With Dot, what made you choose Dot in the first place and then continue with Dot for so many features? I had a very clever mother. She was teaching me a lot of very, very clever things. One of them is your country is where you have your bread - in Australia, when you are eating Australian bread, you're supposed to give something to this country. And coming to Australia, I wanted to make Australian films. I didn't see any reason to make international films or Polish films, being in Australia, or Israeli films. And looking in libraries, I found this Dot and the Kangaroo, which wasn't very popular in those days, because it was written over 100 years ago, and the mothers remembered Dot and the Kangaroo, but the little kids didn't know anything because the language wasn't really language that we generate today; the original book is written in a completely different way and the aborigines are not portrayed in a very positive way. And we jumped onto Dot and the Kangaroo, especially that we had a chance to put words in the kangaroo's mouth. Usually they are not talking. This kangaroo was communicating with Dot. Really I prefer to make animated films using animals than humans, because humans we can have a live action and good actors can do the job. But kangaroos or dolphins or another animal can't do the job properly. Skippy in live action, which was a series on television, the only word was a "tsk-tsk-tsk". It is not enough to understand. Our Skippy is talking, and talking a lot about kangaroos and about a kangaroo's life, etc. So with the Dot films and making them so Australian, you're able to focus a lot on Australian themes, as you mentioned, the aborigines and the animals, so that in a way your films have provided a lot of education about things Australian, while enjoyable. Yes. All our films, if you watch them, they have some moral. They are not educational films in the sense of school .......... because they are entertaining films. Nevertheless, they always have some moral. This I believe I learn in Poland in Polish films, which Polish films weren't based on a business because it was a government. They had enough money for this. And therefore this was my school, really, until today when I am doing a thing, I really first of all would like to say what I want to say and not thinking about how much money we can get from the film. And we're lucky, those films are sold overseas in a lot of countries and we can survive. We've survived already thirty years in this business. So you have done a lot, really, to help children understand the environment of Australia, with the kangaroos and the whale, if I remember, and also the other thing - seeing The Little Convict, you also went back into Australian history. Yes. The Little Convict was our second full-length feature made in Australia. We had been lucky to convince Rolf Harris, who is a very good actor, to join us and to help us and he has done a really magnificent job. In the time when The Little Convict was done, or before, I visited Old Sydney Town. Such a magnificent location, and as I mentioned before, we had been doing animated films on live action background, and we used Old Sydney Town as a background and it was really part of the history of Australia - as the title says, The Little Convict. The film recently I have seen after so many years again. I must say it's not so nice, but I still like it, I like it very much. I have seen this film because our Australian Embassy in Washington is asking me to make a tour in America, to different countries to show parts of those films. I have seen The Little Convict again; I would like to take the best parts, of course, of the films to introduce to the American audience. The Australian Embassy in Washington tried to make screenings for media people, films critics, radio, education departments. I'm very excited and probably next year it will happen. Just some comments on Camel Boy, Epic and Sarah - that again with Epic and Camel Boy, again you're taking us into aspects of Australian history. Not so much. Sarah, which was Mia Farrow, it is really my personal film, wartime, not very good for children, nevertheless it was good for me, as I mentioned before, I said what I wanted to say. A little bit of my personal history during the Second World War. Epic, it is a rather Australian film - I can't say very successful, a little bit too much experimental film, too much abstract story. That's an interesting thing, I suppose with Sarah, that you've focused - one of the commentators, Rafael Caputo, has the article in Scott Murray's book, the two pages, it was in Cinema Papers - and I notice he picks out three themes and the Australian was one, and the social and political comment the other. But the third was displaced people. He says that somehow or other, with the convicts, I suppose, and with Sarah and even with Epic, people who somehow or other are moved away from where they belong and have to find a new home, so he was saying that was one of your major themes. I don't know whether you agree with that or not. Yes, I agree. Australia is my third country. I was born in Poland, as a kid lived in Poland, then jumped to Israel, another country, another language, another culture, and for the last thirty years in Australia. Something on, say, The Magic Riddle, which was a bit different. It didn't have the live background. Magic Riddle is another, I have to tell you, personal story. The last film before Magic Riddle - I can't remember, but we produced an Australian film, probably it was Epic, which wasn't welcomed by the special committee in Australia, not good for children, bad for children. And Epic wasn't accepted as a film good for children. It was very, very not clever argument or - for example, one of the comments was that the music is too loud. The music was Tchaikovsky, which was quite known and quite a composer. These kind of comments - and finally the film wasn't accepted. I was extremely angry and I said, "Okay, if so, I won't make any more Australian films. I will make international films." In such a way The Magic Riddle was written, taking all kinds of Grimm Brothers fairy tale stories and we put them together. We succeeded to put to cinemas in Sydney, it was a big success, but unfortunately during the two weeks holidays only, which is not good enough. Then we had a nice sale to the United States, and this was a really international film which has nothing to do with Australia and without any big morals and without any indication - it was just I was angry to do something against this committee, which I didn't appreciate very much. But then you went back to Australia with Blinky Bill, and he was a success. Some of the writers about your work link you in two directions: with visual artists and film-makers, and also then with people who experimented in the 19th century with cameras and animation. Do you see yourself as developing those traditions - do you see yourself as an artist? I think so. Anyway, if I don't see myself as an artist, those critics see me as an artist. Now I'm quite proud. It was a film festival in Rome, in Italy, which my two very old films have been invited, which was a festival of films that brought something new to cinema. They were We Shall Never Die and Chansons en Parol - Song Without Words - which I have done a long, long time ago, but they found it and any day we should get the program of the festival. I'm happy. My grandchildren will say their grandfather brought something new to cinema. Those are two experimental films. Those animated films, the Blinky Bills, the Tabalugas or Flippers, they are traditional animated films, not in the high standard of Disney, but we don't have the high standard budgets. That's true. But you have experimented over the decades, then, especially with the live action and the animation together, and you've developed your very distinctive style. Unfortunately, I am not progressing with the style any more. As I told you, time, time - the days are too short now. It's quite an achievement the thirty years in Australia, because you have added something distinctive to the Australian film industry. So thank you for that.